The subject of Muse endormie is Baroness Renée-Irana Frachon, who modeled for Brancusi in his Paris studio at 54, rue du Montparnasse. She later recalled that the artist “asked me to sit down and to close my eyes, to keep my face still so that he could capture the expression of serenity one has in sleep.” 1 The result was this attenuated female head with pared-down, abstracted features that captures the essence of female beauty. 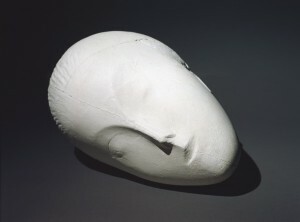 In contrast to the huge amount of ink the Armory Show critics spilled over Brancusi’s Mlle. Pogany, Muse endormie was not targeted for specific notice. From New York, the plaster traveled to the exhibition’s Chicago and Boston venues. Photographs of the exhibition’s Chicago venue show that the works were displayed in the same gallery, but Mlle. Pogany was far more prominent because of its vertical orientation and large square base. 4 The plaster of Muse endormie was offered for $270 and was purchased by Mary Harriman Rumsey on April 30, 1913. Quoted in Anna Chave, Constantin Brancusi: Shifting the Bases of Art (New Haven: Yale University Press, 1993), 47. The other plasters are both in the Musée National de l’Art Moderne, Paris. See Milton Brown, The Story of the Armory Show, rev. ed. (New York: Abbeville Press, 1988), 202.